This is a nice package two CD’s under the title of ‘Two For The Show’. You actually get a newly issued studio album called ‘SINS’ and a live album ‘Live’ At Mr Kyp’’, and both albums are very good. Let’s be honest here this is no frills down to the bone British Blues, some of the best of its kind. On the menu are lashings of John’s masterful harp playing and top quality side dishes of Jules Fothergill’s mercurial liquid sounding guitar. They weave around a selection of classic blues and R&B covers and some originals. The studio album tracks were recorded in 2004 and according to Paul Watts informative liner notes this was originally privately produced by John O’Leary, who sold ***** plus copies. It’s now officially released on the re-launched Acrobat label. So thank you to Paul Watts and co for making this available. It is difficult to say which of the two sets – live or studio has the edge; there are in any case similarities – ‘Early In The Morning’ is on both albums – the same number is credited to John Lee Williamson (the original ‘Sonny Boy’ I believe) on the live set, and ‘Traditional’ on the studio set – this seems to be a favourite tune of John’s, he opened with it at the Cyril Davies tribute at the Eel Pie and it is a great groove – both versions are very good but the studio version has a strange ending. The Nick Gravenites’ song ‘Born In Chicago’ on the live set is good. There is much to enjoy on both albums- good playing, especially Jules Fothergill- his special qualities – he stretches to the places where most players don’t venture – and he knows how to build – to build tension- variations on a phrase- and most importantly where to release tension and finish. 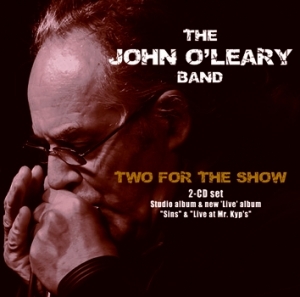 John O’Leary’s harp is excellent and the vocals are good as well, peaking on ‘House Of Ice’ and ‘Move Away’ on the studio album. All in all I recommend this to readers, it’s very good.